So, one week in to the Bellyfat Cure, I am not starving! Yay!!! I'm still eating bread (just not as much) and the major thing is I have cut my sugar back dramatically! On a regular morning, I would probably have 15 grams of sugar in my morning coffee. Coffee is less than great at this moment, but it will do and it's not awful. I think the hardest thing for me are snacks. I'm a huge snacker. I love crunchy salty snacks. I decided to buy some bagged popcorn (it was the healthiest of the bagged snacks) and have it. Carb content was low and sugar was 0. Mistake! Two nights ago I fixed a pasta dish with a gluten free pasta that was made with quinoa and corn flour, it was delicious and fixed my pasta craving. After dinner I was starving, so I snacked on some of that delicious popcorn. Yeah.... Guess what, I think I have a BIG grain issue and it also includes corn. I was miserable and swollen the next morning. Lesson number two, wheat and corn are not nice to me, both cause inflammation (that I have seen) and horrible pain. So I am trying now to avoid both. If I only have a little of each I seem to be ok, but too much and wham. Anyway.... Snacks! I also get a sweet tooth at night. I really just need a little bite of something to satisfy it. 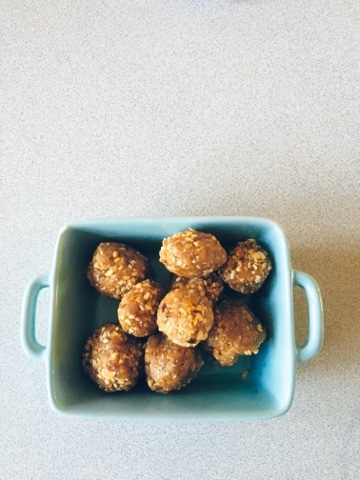 I found this date ball recipe and let me tell you, delicious!!! Tastes just like a peanut butter cookie! They are easy to make, which is another huge plus! Combine all in a food processor and process until combines. It will have a crumbly texture, which I found is fine. I just kept testing it and trying to smash it together to see if it would form a ball. Once finished, form into balls. I store mine in the fridge, I like them a little bit more firm and cold. YUM!